I loooove living in Florida. One of my favorite parts about living here is that it reminds me of my hometown, but much warmer. It still feels a lot like where I grew up, just way hotter sometimes, and we definitely don’t get lake effect snow here. I grew up in the northeast in a pretty rural area, surrounded by lots of family farms. I feel particularly at home in the northern part of Florida when I’m visiting Tallahassee. It feels so much like my small hometown, and also like the college town where I went to school for undergrad. I can be driving through the rural parts of the state, and I love seeing family farms and cows along the way. It reminds me of where I grew up. There are 130 dairy farming families in Florida, and for generations, they’ve committed to producing fresh, wholesome, quality milk. The dairy farms in the state are mainly owned and operated by second and third-generation farmers, and they are hardworking men and women that serve as caretakers of the cows and stewards of the land, but also leaders in their communities. The leading dairy counties in Florida are Lafayette and Okeechobee. Most dairy cows are Holsteins – the black and white cows – and most dairy herds range in size from 150 cows to 5,000. Each Florida dairy cow produces 6-8 gallons of milk each day. Collectively, there are about 123,000 dairy cows in Florida, and they produce about 2.34 billion pounds of milk a year. That equates to 277 million gallons of Florida-produced milk in grocery stores. What’s great about Florida dairy farms too is that they recycle 170,000 tons of byproducts such as citrus pulp, brewers’ grain, and whole cottonseed that are consumed by the cows instead of ending up in landfills. Growing up, my brother and I drank a TON of milk. He actually drank a gallon himself in two days. We were always flying through it. These days, I mostly drink milk in the mornings. I love it in my cereal, of course, because I’m a big cereal person, and always have been. It’s also the first thing I crave when I wake up sometimes. I open the fridge, and I’m not embarrassed to tell you that I chug straight from the carton. Just a couple big swigs of milk. For some reason, I most crave it first thing in the morning, and I don’t even wait to pour a glass. I see it in the fridge, it calls out to me, and I just take a few big gulps. It’s so satiating. I probably find it so satiating because milk contains 9 essential nutrients and vitamins, including protein, vitamins A, D, and B12, calcium, potassium, phosphorus, riboflavin, niacin, zinc, and magnesium. Three cups of milk a day fits your recommended daily allowance of dairy! I also use it a ton in baking. Milk is great for moistening baked goods, and the protein and sugars in milk add structure, texture, and flavor. Aside from drinking it straight, using it in cereal or smoothies, and adding it to baked goods, it’s also a key ingredient in my favorite basic recipe for crepes. Yep, milk can even have a time and place in cooking. 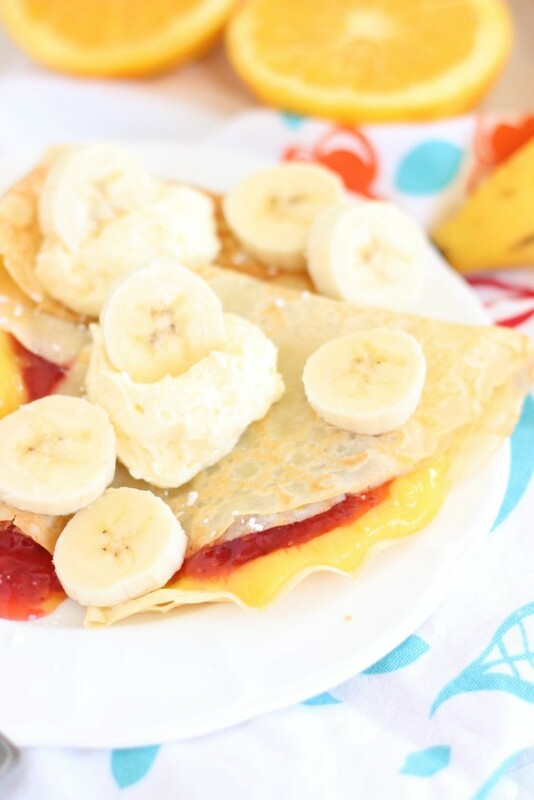 My crepes are crispy at the edges, and soft, almost a little chewy in the middle, and they are thin, delicate, smooth, and buttery. 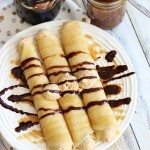 They are very adaptable – you can add a little sugar to make them sweeter, cocoa powder for chocolate crepes, liqueur, extracts, or zest for flavor, and you can use the basic recipe as-is for savory crepes! 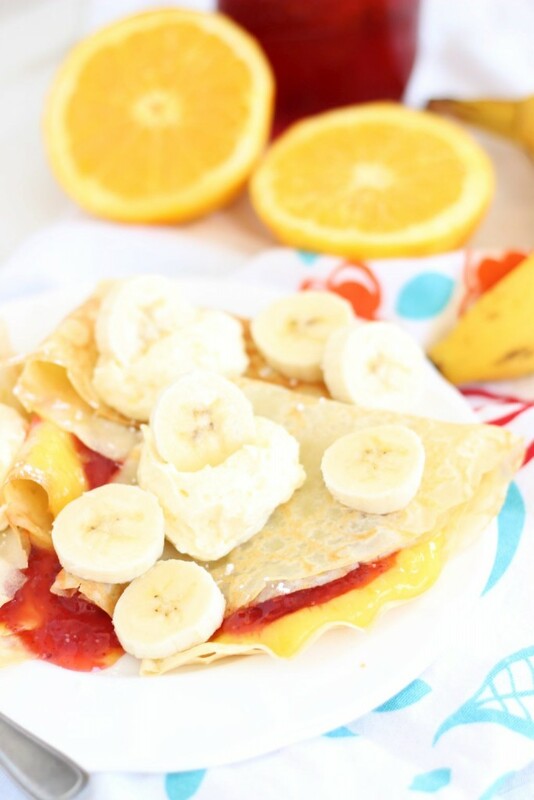 These Strawberry Orange Banana Sunrise Crepes make for a perfect breakfast, and Florida milk is a key ingredient in making these crepes as incredible as they are. 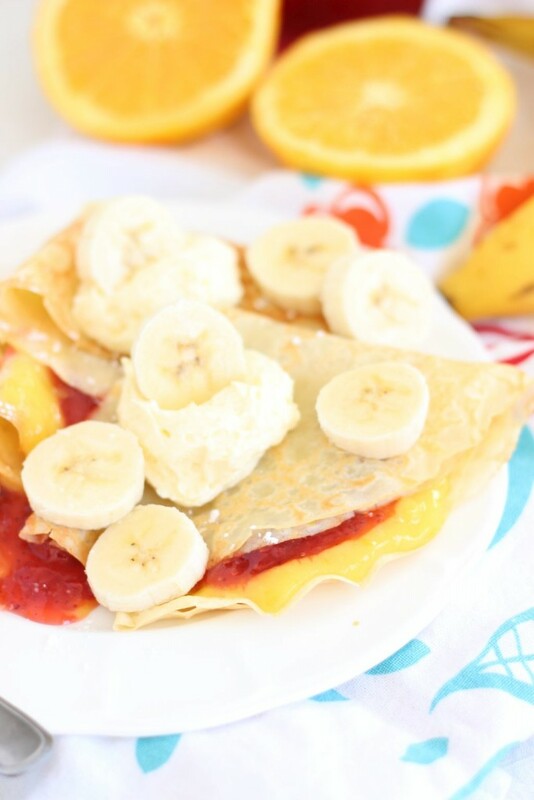 I added orange zest and fresh orange juice to the crepe batter, then filled the crepes with a batch of homemade orange curd, and a spoonful of strawberry jam. They’re topped with whipped cream and fresh banana slices. 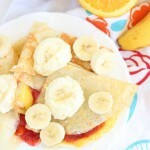 One of my favorite combinations of fruit flavors – strawberry, orange, and banana. 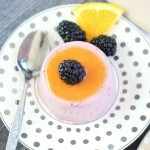 An elegant breakfast dish with the help of Florida milk and lots of fruit! Thanks so much to the Florida Dairy Farmers for their hard work and dedication, and for sponsoring this recipe! Please be sure to follow them on Facebook | Twitter | YouTube | Instagram | Pinterest for news and great recipes! 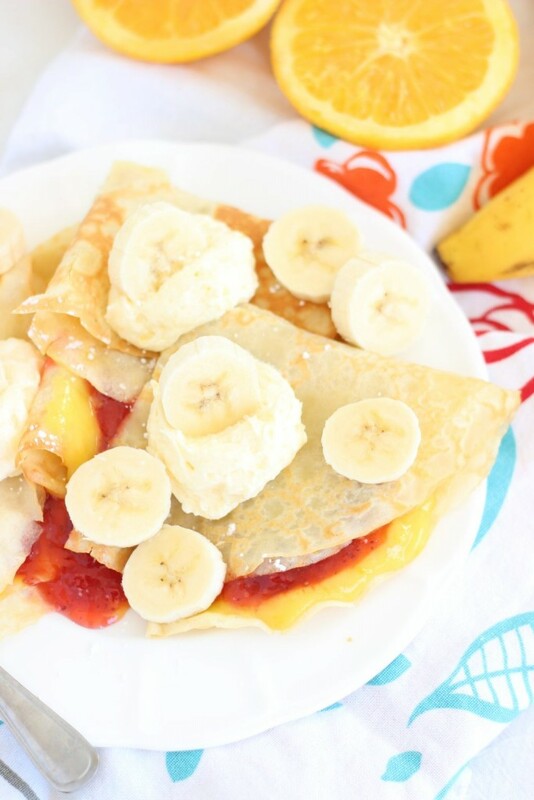 Thin and delicate crepes with homemade orange curd, strawberry jam, and banana slices! In a small bowl, whisk together the egg yolks, orange zest, orange juice, sugar and salt. Transfer to a small saucepan. In a large bowl, combine all crepe batter ingredients and whisk until smooth. In a large saucepan over medium heat, pour scant ⅓ c. batter, covering the entire bottom of the pan in a thin layer. Cook for 2-3 minutes, or until the top looks mostly cooked too, even before flipping. 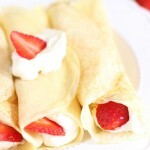 Carefully (it will be thin and delicate) flip the crepe over, and cook for about 30 seconds. 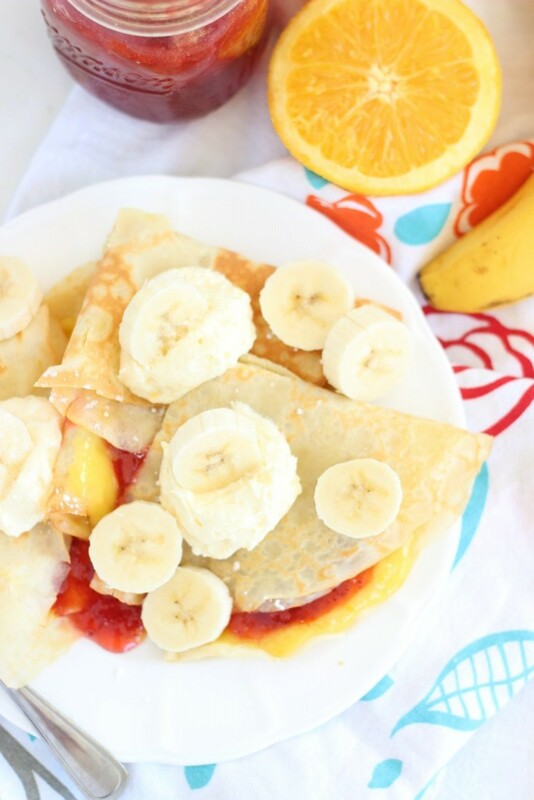 To assemble: Fill each crepe with a heaping tablespoonful of orange curd, topped with a heaping tablespoonful of strawberry jam. Fold in quarters, and top with whipped cream and sliced bananas. Serve immediately. I think I’d be celebrating the lack of lake effect snow (hello….Lake Erie!) 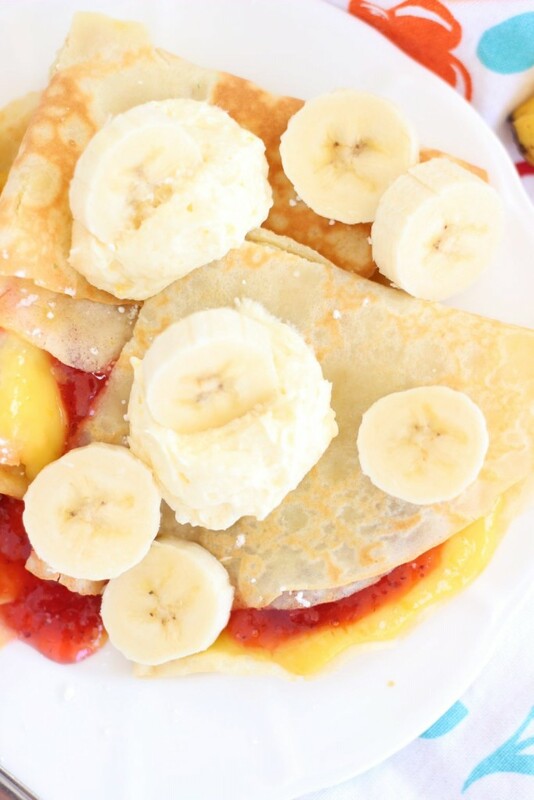 if I lived in Florida with these lovely crepes! They just look like sunshine to me! Oh, I definitely do. Lol! It’s the whole reason I live here. No more Erie winters! Haha! These are so beautiful! They remind me of a Florida sunrise. I would be happy to wake up to this for breakfast anyday! I didn’t grow up in Florida, but my husband did. His family lives in the rural part of the county, and I love it so much when we venture that way. So working with FL Milk, and dairy farmers made me feel closer to them. 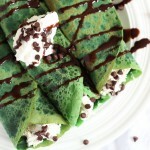 In other news, these crepes look SOOO good! I love the rural parts of FL too. I go to Tallahassee for work sometimes, and I love being in that part of the state. Reminds me of Pennsylvania a lot, actually! 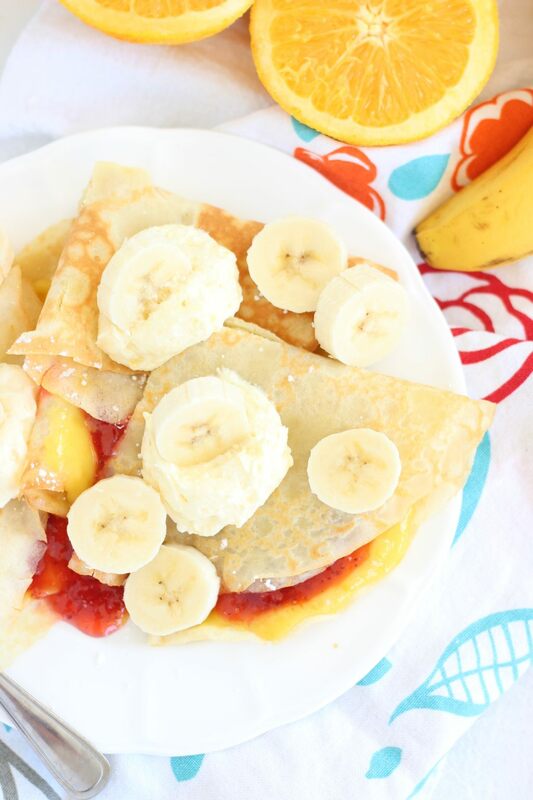 Sounds like a yummy crepes recipe! I need to get a new pan so I can make this. This dish is like Florida on a plate! Bright and sunny. I love the combination of orange, banana and mango too! 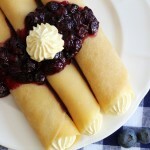 And crepes look so fancy yet easy to make. Haha! That’s so true! These are very Floridian! !